Join Us at the Launch and Star Party! Watch your star name launched to space! Name A Star Live is the only star naming service that launches your star name into space! Name a star with us and join us in person to watch the launch of your star name. We’ll be hosting a star party too where you can view the stars and planets through telescopes. If you can’t join us in person, you watch via webcast. 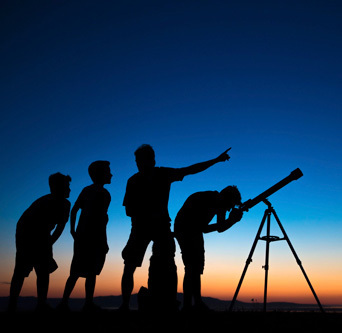 See the stars and planets at our star party in New Mexico. It’s all happening in April 2018 at a place called “Spaceport America” in New Mexico — about a two-hour drive north of El Paso. This 21st century spaceflight facility will be used by Sir Richard Branson to fly space tourists into the Final Frontier. Spaceport America is also one of the launch locations we use to fly our customers’ star names. 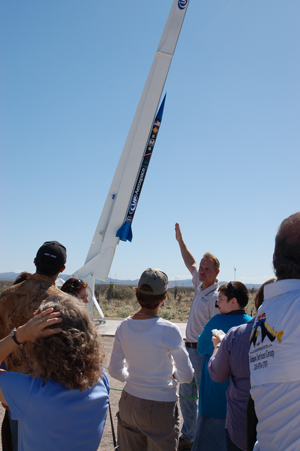 Watching a launch occur over the majestic landscape of New Mexico — the “Land of Enchantment” — is simply breathtaking! Plus, you can tour Mission Control and view the rocket on the launch pad. Name A Star Live makes you a part of real space missions, and you get the full experience at Spaceport America. 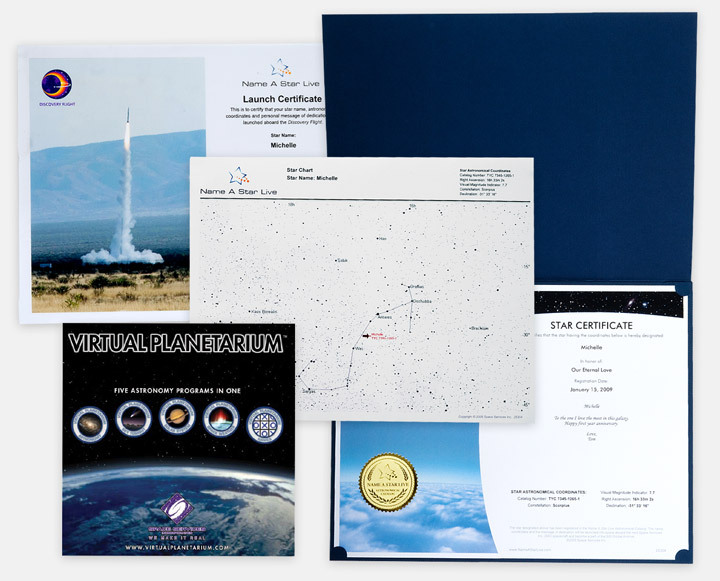 After we launch your star name, you get a letter-size, Digital Launch Certificate confirming that your star name was part of a real space mission. 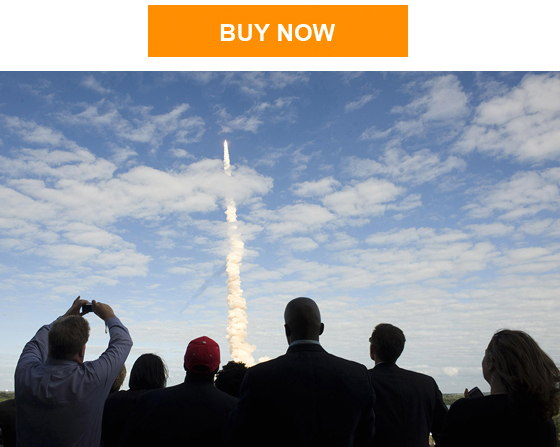 If you can’t join us for liftoff, you can even watch the launch online. What a wonderful Christmas gift! So name a star today! Our Instant Gifts are provided to you via the Internet: Download, Print and Give right away, 24/7! Our Keepsake Gifts are printed and shipped to you or to your gift recipient. We offer free Priority Mail shipping to U.S. addresses. Get one of our Instant Gifts that’s called simply the “Instant Gift Set” — a $19.95 value, absolutely free! 1. Visit our site and add any Gift Set to your cart. 2. Enter your special offer code at checkout. 4. Name both of your stars and gift them to friends & family! Good through Monday, December 25, 2017. One of our most popular Keepsake Gifts is the Deluxe Gift Set, which starts at $54.95. Shipped to you or your gift recipient, it includes everything you’ll need to make the stars come alive. It’s a great name-a-star gift for Christmas, Hanukkah, Valentine’s Day, Mother’s Day, a birthday, graduation or any special occasion. A letter-size, Printed Star Certificate showing the name of your star, your star’s astronomical coordinates, and a personal message you can write for your gift recipient. A Star Chart showing the location of your star within its constellation (area of the night sky, such as Aries or Taurus). You get to choose the constellation for your star. Our award-winning Virtual Planetarium astronomy software that brings astronomy to life with seven great programs in one. Explore the Universe with interactive games, breathtaking NASA imagery, and the latest updates from exciting space missions. Plus see a display of which constellations and planets are visible from your home each night. Suitable for all ages. 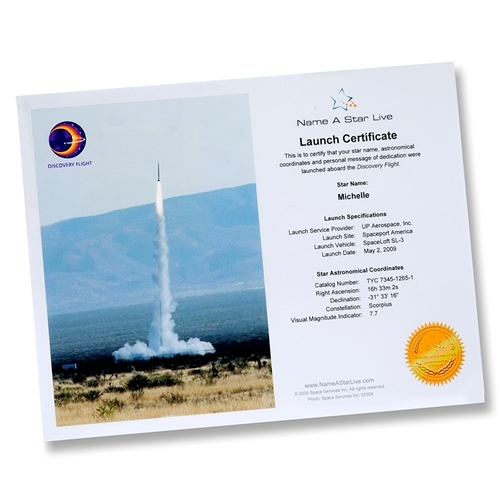 A Digital Launch Certificate provided to you each time we launch your star name into space! You get a Digital Launch Certificate each time we launch your star name into space — with Name A Star Live, you’re made part of real space missions! Next Next post: BOGO and Watch Your Star Name Launched to Outer Space!